This autobiography spans 70 years of involvement in ministry and mission, especially in the last 30 years of renewal and revival. This is an Australian story, with global relevance. Accounts of renewal in Australia and revival there and overseas fill the last two chapters, with a two chapters describing pioneering teaching in Papua New Guinea. The author, a Baptist minister, worked with many denominations overseas and in Australia. He taught Baptist ministry students in Papua New Guinea, and in Australia also taught Methodist and Uniting, Anglican and Catholic, and Pentecostal students. ^He taught church and revival leaders in many countries including in Africa, Asia, and the South Pacific. The book considers implications of being one in the Body of Christ in the unity of the Spirit in the bond of peace. 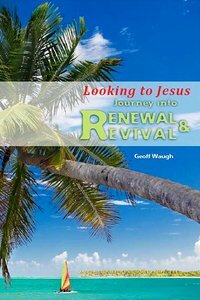 :Geoff Waugh gives an autobiographical account of his life and involvement in renewal and revival in many nations. Customer Reviews For "Looking to Jesus"
I have been blessed to be a student of Geoff Waughs in the COC Bible College in Brisbane. This book was such a blessing. It showed how God has been such a huge part of Geoffs life, since he was a young boy. It was really inspiring to read the book and to realise all the amazing things God has done through Geoff, that he is not just a teacher on revivals, he is really someone who lives it! I highly reccommend this book. We need more fathers in the faith who have walked with Jesus for so long and who have seen real moves of the Holy Spirit to share with us and encourage us like Geoff does in this book.This is not just a biography, it is a book that will teach and inspire you in your walk with God. This book traces the author's journey through a lifetime of discovering renewal and revival. He explores the transforming and unpredictable nature of God's Spirit now touching and changing people in all denominations and in all countries. The book will interest people who love to read about renewal in the church and revival in the world. The author's other books such as "Flashpoints of Revival" and "Revival in the South Pacific" give fuller and more general descriptions of God's transforming work around the world. This autobiography gives a personal account of the author's experience of renewal and revival in Australia, the South Pacific, and in other nations. "Looking to Jesus" points continually to Jesus, the One who renews and revives us by his Spirit within us and who is so powerfully at work in the whole world. Geoff Waugh's life and ministry have influenced people all around the world. This autobiography with reflections will be of interest not only to those who know him. Beginning in Australia, then Papua New Guinea, his invited ministry in renewal and revival has involved every continent. While he has written "Flashpoints of Revival"  (recently updated) recounting revivals in the past three hundred years around the world and many books of bible studies this book "Looking to Jesus" has a different  focus, as Geoff traces his journey from strong roots which remained the solid core of his life from childhood to marriage to retirement. Here is a personal journey with reflections that will enrich the lives of all readers. As he ?looked to Jesus? along the way he was opened up to many exciting new ventures in Australia and into countries where revival and renewal is vibrant, changing many lives. Although a biography, many others are involved. Geoff?s journey is like a rose bush with strong roots and branches. He is one bud of many, opening into a beautiful bloom as he opened himself to God?s leading into an exciting journey. A bonus is an appendix with outlines of his other works. Dr Waugh's account in "Looking to Jesus" demonstrates his passion and servanthood life, displayed in His calling from the pulpit to the mountains and valleys of the Pacific and beyond. His passion, zeal and commitment to the Gospel makes Him a true missionary to places where we wouldnt dare. I would recommend this book to all, the story of a man who is truly sold out to His King and Master - the Lord Jesus Christ.